If ash trees grow on your property, you should be aware of the issues caused by the emerald ash borer (sometimes called EAB), a beetle originally native to northeastern Asia. In the late 1990s, the borer was accidentally introduced to Canada and the United States and has since been classified as an invasive species. 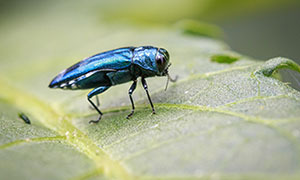 At Schulhoff Tree & Lawn Care, Inc., we want homeowners in Denver, CO, to be aware of these beetles and how emerald ash borer treatment can benefit your landscaping. The emerald ash borer was identified in Michigan in 2002 and has spread across the United States ever since. It has now reached Colorado as well. In its native Asia, emerald ash borer populations are suppressed by resistant trees and predators, but without those factors, they have risen to worrisome levels. Emerald ash borers have a lifespan of up to two years. Adults deposit eggs between crevices in the bark of ash trees. Larvae, once they have hatched, will chew through the tree as they develop. As adults, they emerge from the ash trees after boring D-shaped holes in the ash bark. 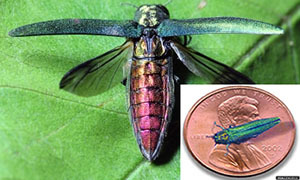 North American ash trees are very susceptible to these beetles, and without emerald ash borer control, ash trees in any given area are expected to die within 10 years. Because of this, emerald ash borer prevention and control is paramount to maintaining the health of your ash trees. 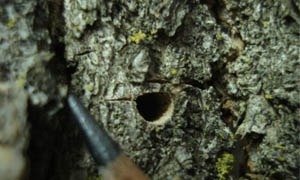 D-shaped holes in the bark — Adult borers leave ash trees through these holes, so an infected tree will be covered in them. S-shaped tunnels beneath the bark — You can check for these by peeling back sections of bark. Attention from woodpeckers — Woodpeckers often attack trees that are infested with insects, so this might be another indication of a problem. If you notice emerald ash borer damage on your tree or suspect a problem, have your trees inspected by a professional. A professional can treat and prevent emerald ash borer damage using a specially produced insecticide. The treatment can be injected into the soil or the trunk or sprayed into the canopy or onto the bark. Your landscape professional will consult with you about which treatment will be most effective, but generally, injections tend to deliver the insecticide directly to the infected area. Know that timing is critical to the successful treatment or prevention of an emerald ash borer infestation. Since this invasive species has been found in our area, you should protect your ash trees proactively and seek the help of a tree professional. Call (303) 279-1910 for more information or to schedule emerald ash borer treatment for your ash trees.